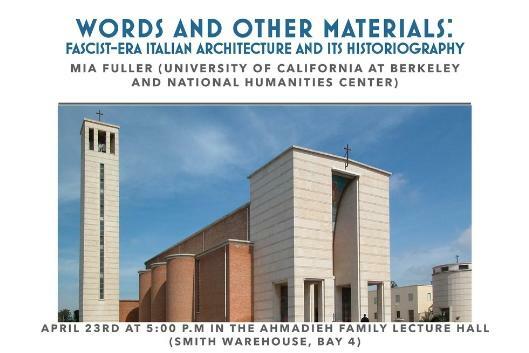 Please join us April 23rd at 5:00 p.m in the Ahmadieh Family Lecture Hall (Smith Warehouse, Bay 4) for the talk, "Words and Other Materials: Fascist-Era Italian Architecture and Its Historiography," given by Mia Fuller (University of California at Berkeley and National Humanities Center). Mia Fuller is the author of Moderns Abroad: Architecture, Cities, and Italian Imperialism (International Planning History Society Book Prize Winner), which marked a turning point in discussions of architecture and city planning in the Italian colonies, as well as of Italian colonialism. As suggested by her article titles, including "Preservation and Self-Absorption: Italian Colonisation and the Walled City of Tripoli, Libya," "The Medina and the Islamic City: Colonial Terms and Postcolonial Legacies," and "Mediterraneanism: French and Italian Architects' Designs in 1930s North African Cities," her work brings together a wide range of topics. It generally builds on ethnographic, architectural, and oral-historical study, and focuses on the interplay between place, power, and memory. She is the co-editor of the important collection Italian Colonialism: A Reader. A cultural anthropologist and urban-architectural historian, Mia Fuller is Associate Professor of Italian Studies, faculty member of the Center for Middle Eastern Studies, and director of the Institute of European Studies at the University of California at Berkeley. This year she is a fellow at the National Humanities Center.